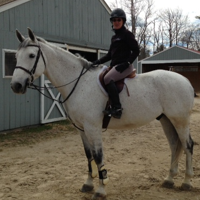 The search for the perfect ring is difficult enough: what do you do when you’re searching for the perfect sweetheart ring for the horse lover? For that special occasion — or perhaps even an engagement? Maybe you’re not getting married — but you’re still searching for the quintessential rider’s ring, a stunning piece in gold and diamonds that captures both your personal sense of style and your passion for horses? 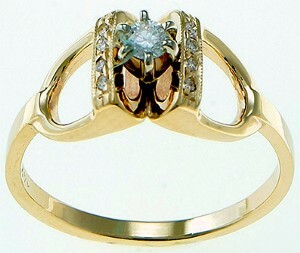 In that case, you’ll want to look at this 14K Gold and Diamond Stirrup Ring! Rendered in 14K gold, this stunning ring features pave diamonds surrounding a elevated single center diamond. Framing the stones on either side, the elegant lines of a pair of stirrups curl up to surround your finger, the embrace of equestrian style close fitting and secure. Appropriate in every environment, this is a unique piece that conveys your personality without being over-the-top obvious: striking a fine balance between personal style and classic elegance and grace. Should you be in the market for a suite — and really, who doesn’t like to be put totally together, whether you’re in the boardroom or the show ring? — you’ll want to take a moment to check out the matching earrings. 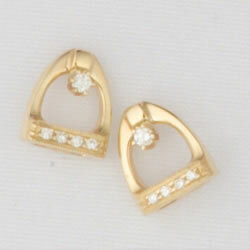 These 14K Stirrup Stud Earrings with diamonds are a fantastic size – just 3/8″ long, they’re big enough to make an impression without being garish. They’re a perfect match to the Stirrup ring, but can work perfectly well on their own, too! They’re great to add a touch of equestrian style to your outfit — or a fantastic piece if you’re beginning to build your own horse jewelry collection. A favorite set of earrings for many competitive riders, these stylish, elegant stirrups feature a large single diamond centered in the stirrups arch and a row of four pave diamonds below. They catch the light beautifully, adding a gleam of rich sparkle to your appearance. Together, the stirrup ring and earrings are a powerhouse combination. Each piece also works separately, offering you maximum versatility and wearability: you’ll be able to enjoy these pieces often and confidently!